Wooden toys have been played with by children for hundreds and quite possibly thousands of years. Throughout history children would find everyday things in their environment such as sticks and rocks and use them as toys. 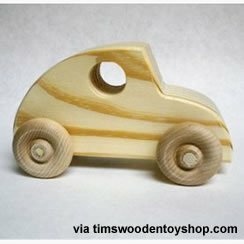 As society progressed toy makers would make toys for children and the material of choice was wood. However, in more recent times, toymakers have begun to use synthetic materials and plastics to make toys. Even so, wood toys have always remained and are beginning to make a comeback. 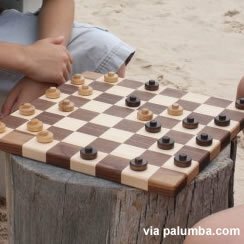 Why Use Wood To Make Toys? Is wood really a better material than synthetic materials and plastics to make toys? It would seem that using wood to make toys is bad for the environment because this means we must cut down more trees. Actually, it’s better for the environment to use wood to make toys. Modern wooden toys are often made from renewable sources like tree farms. On top of that, wooden toys are biodegradable while synthetic materials and plastics are not. 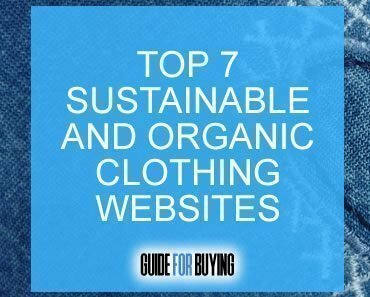 Also, synthetic materials and plastics leach chemicals into the environment. So as we can see, using wood is truly the best way to make toys! Since wooden toys are such a great option for children, where can you buy the best wooden toys on the market? There are hundreds of websites that sell wooden toys so Guide For Buying set out to find the very best places to buy wooden toys online. 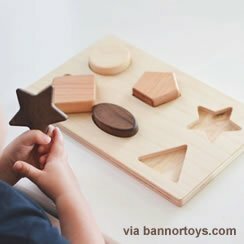 After scoring the web looking for the best websites to buy wood toys, below you will find the top 25 websites to buy wooden toys online. The story of Fat Brain Toys is one of those stories that leaves you with a smile. In 2002, Adam Carson who was 10 years old at the time, received a Geomag for his birthday. Adam developed a fascination with this toy and wanted to buy a a larger set. However, he soon discovered that finding a larger Geomag set online was not so easy. 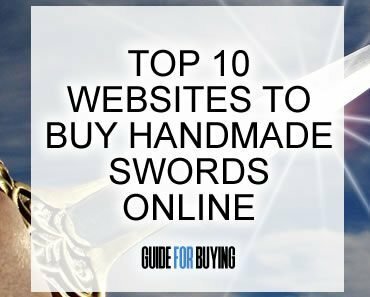 So, Adam made a suggestion to his father, who was a web developer, that they start their own online store and sell Geomags. That’s when Fat Brain Toys began! 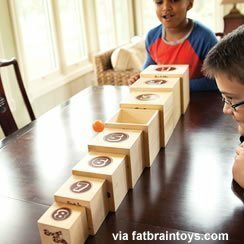 Today, Fat Brain Toys has over 7,500 toys, games, and gifts. They’re not just a company that sell wooden toys but they do have an amazing variety of wooden toys to choose from. In fact, the have close to 200 different wooden toys in stock! Everything from a Mega Race-Car Carrier to a wooden game called Box & Balls. Bella Luna Toys was started by Sarah Baldwin a former actress, mother of two, and Waldorf teacher in 2002. After 15 years working with children in the classroom, Sarah decided to launch Bella Luna Toys. Her desire was to give children beautiful, natural toys that she called “Waldorf toys”. Waldorf toys are toys that are wooden, good for the environment, and organic. Beyond that, Waldorf toys are good for children! They help to nourish the senses, they’re beautiful to look at, and inspire the imagination. Bella Luna Toys offers a wide selection of wooden toys. A best seller and Sarah’s favorite toy is their “Waldorf Rocker Board”. Oompa is another natural and wood toy company owned by Sarah Baldwin, the same owner of Bella Luna Toys listed above. Sarah is a mother of two boys who are now fully grown, an early childhood educator and she is also an author. She has over a decade of experience in the natural toy business. Oompa has high standards for toys. They look at safety and play value. If it doesn’t meet those standards Oompa will not sell it. Oompa does not sell plastic toys. Every one of the wooden toys sold by this toy company from letters to dollhouses are made from sustainable materials. Plus, every wooden toy has an all natural oil as its finish or a safe water-based coating. This ensures that all wooden toys sold by Oompa are safe to use. Melissa and Doug are the parents of 8 children and own a thriving worldwide business. However, it didn’t start there. As all successful businesses, it took hard work and determination to make it all happen. The Melissa and Doug story is a story of love. A couple’s love for each other and their love for children. Melissa and Doug were both raised by parents who were in the education field. They knew early on that they wanted to create children’s products that were meaningful. When Doug proposed to Melissa at age 24, his proposal was a business proposal. The two went into business together and then a few years later, were married! 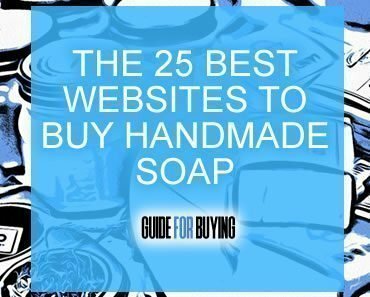 The two took all of the money they had and worked tirelessly to create their first product. 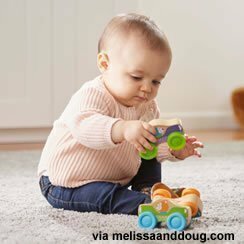 Like many successful businesses (Amazon, Google, Mattel), Melissa and Doug was also started in a garage! 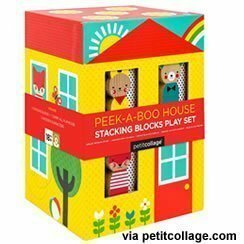 For the next 10 years Melissa and Doug created wooden puzzles. They eventually had 1,000 different styles. 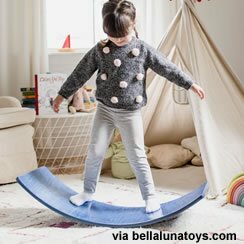 From there they made the decision to reinvent wooden toys to make them even more fun and creative. Today the Melissa and Doug company has a wide variety of wooden toys that are prefect for children to learn and grow. Here is a company that sells natural wooden toys that was started by a stay-at-home dad in 2003 and is still family owned today. The Wooden Wagon’s mantra is being about the simple, the natural, the safe, and most of all the fun. From the very start, The Wooden Wagon seeks out only the best quality natural toys that can be found. The company only sells toys that they would want in their own homes. The Wooden Wagon uses manufacturers that are also family-owned businesses. They like to work with other companies that share their values. They use only the very best materials in the manufacturing of their toys. This includes non-toxic stains, paints and finishes. Many of the toys found at The Wooden Wagon are handmade. 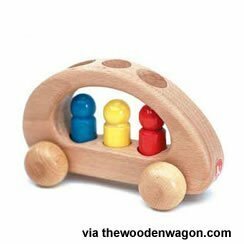 Beyond the quality of the manufacturing processes used by this company, The Wooden Wagon looks closely at the play value of each toy. Their goal is to provide toys that help develop the imagination. This is why they love simple toys. Toys that do not require batteries, have no noise or lights can help to inspire children. Started by Susan and Ted Blood, Nova Natural has been providing natural toys and crafts to children for close to twenty years. The driving force behind Nova Natural is to develop and offer wholesome toys and products that can help children to grow and thrive as an individual. Everything Nova Natural does from selecting products to supporting their employees, they try to function as sustainably as possible. 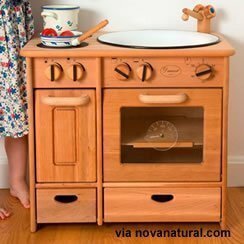 Nova Natural offers a good variety of wooden toys from wooden kitchens to beautiful wooden dollhouses. Next on our list is a real wood craftsman John Michael Linck. For over 43 years John Michael Linck has been handcrafting wood toys a tradition that goes back 15 decades in his family. The toys made by John are of the highest quality. You don’t find many people today that put this much heart into their craft. 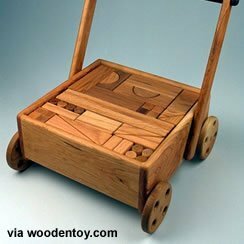 For example, on the woodentoy.com website you can buy a wooden block wagon. This wagon is made of fine Black Cherry wood and comes with 100 Red Oak blocks stacked neatly inside the wagon. Not only do you get the wagon you also get something everything child loves, wooden blocks! This is but one example of the amazing products made by John and you can find everything on his website woodentoy.com. 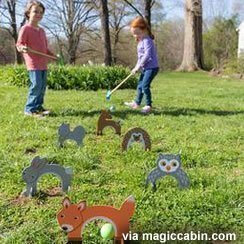 Magic Cabin offers a variety of wood toys for kids of varying ages. They offer learning toys for toddlers who are learning how to count and discern colors. 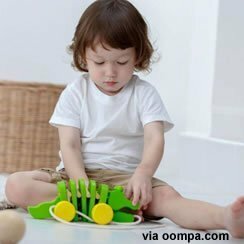 There are toys that promote activity to help to keep children active. Many toys are interactive so that multiple children can play together. There are also toys that kids and adults can use together to promote family time. Some of their exclusive toys include their Tree Fort Kit and Wooden Chicken Coop that includes some felt chickens. Petit Collage started with a focus on sustainability and a modern aesthetic. They have a studio in California where they design all of their products. Their goal is to create playthings, toys and décor that parents and their children will love. They have toys and other items for kids of all ages. You can find a variety of toys and games, living items, and stuff that promotes thinking and creativity, such as puzzles, books and crafts. They have toys in wooden form that are childhood favorites, such as their Doodle + Draw Elephant and their wooden Push Along Lion. The Manhattan Toy Company designs all of their items in Minneapolis. Their goal is to make daily play a joyful experience for children. All of their toys are designed with promoting imagination and having a sense of humor. 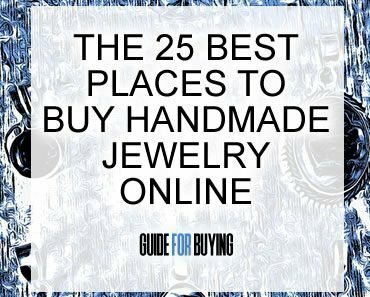 They focus on high quality woods and intricate design for all of their items. They offer a variety of items from their wooden doll houses with wooden dolls, baby beads, which are wooden balls that promote color recognition and hand dexterity and a variety of toddler toys that help them to learn. 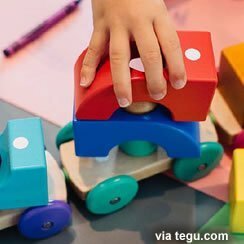 Tegu focuses on creating magnetic wooden blocks that promote creativity, learning and fun. 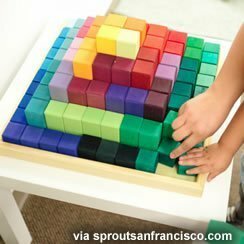 These blocks allow kids of varying ages to build and create. The goal of this company is to make play fun, but also a learning experience with their wood toys. In addition to their magnetic blogs, they have other toys that promote learning and fun, such as trains, color and counting toys and similar items. The designs are simple and colorful, making them easy and enjoyable for kids. 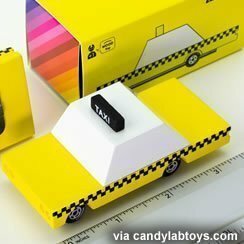 Candy Lab got its start out of a desire to revive the toys that were popular in the 1960s. However, the designs are contemporary. They put emphasis on quality so that toys will not break when a child plays with them for a prolonged period of time. The toys are largely focused on vehicles and related accessories. This company sells in independent stores and online, so people have the choice to see the items in person or order from the convenience of their home. Sprout San Francisco puts focus on only using the healthiest and safest products for children. They want to reduce the chemicals that kids are exposed to when they are designing and creating their toys. They also advocate for safer toys for children. This company offers a wide range of toys and other items that children use on a daily basis, such as their furniture and other household items. Sprout San Francisco also offers classes and informational sessions about creating a safer, healthier home for kids. 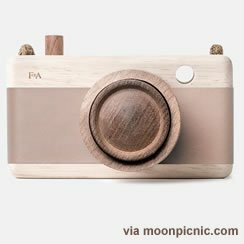 Moon Picnic allows you to shop for wood toys throughout the world. 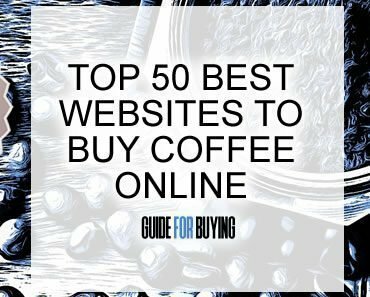 They focus on curating and selecting all of their items carefully. This makes the collection grow slowly, but you can be sure that every item allows for fun and learning. This company does not focus on the trendy toys. Instead, they want to make sure that their items are timeless so that you can pass the toys down through generations in your family. 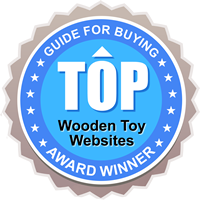 Their wooden toys encompass options for kids of all ages. There are toys that promote imagination, learning, and just for entertainment purposes. Bannor Toys is focused on taking the vintage art of wooden toys and putting a modern spin on them. All of their toys are organic so that they are safe for kids to play with. They make each toy one at a time and all of them are handmade to ensure optimal quality. They have basic learning toys for toddlers and young kids to familiarize themselves with colors, counting and similar activities. There are also learning boards and similar items for older kids who want to play with their friends. 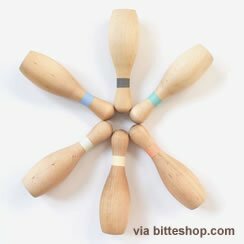 Bitte offers a variety of brands of wooden toys. 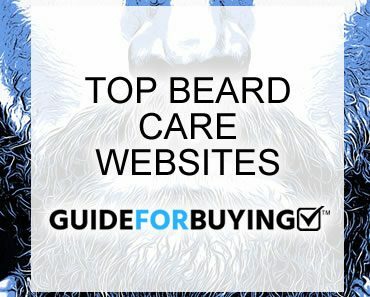 They choose the brands based on quality and what they can provide for children when they play with them. Their toys range from learning toys for toddlers to more sophisticated items that promote play and learning. This company also offers other items such as clothing and milestone items, such as ring teethers. They list some of their favorite items are their Ada Lovelace book, their Bambi Girl doll, and their Camper with Surfboard push toy. 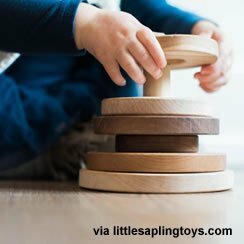 Little Sapling Toys makes all of their items in Utah. All of their items promote imaginative play and developmental learning for children. In addition to toys, you can also find stools and décor that are designed with children in mind. 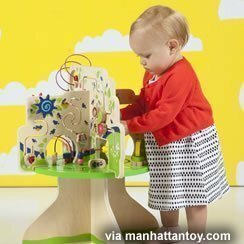 Their toys are constructed from high-quality wood and other materials. They have toys that are focused on learning and others that allow kids to get active, such as their Bowling Toddler Toy. They also have a wooden rocking horse and a dollhouse for kids who prefer more traditional entertainment toys. 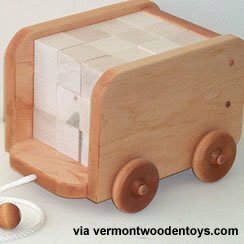 Vermont Wooden Toys has been designing and creating wood toys for more than 45 years. This company creates classic toys made from durable materials. You can find the toys that you loved as a child constructed of wood so that they last for years. There are 125 varieties of toys to choose from. In 2015, they made the transition to creating toys that are completely natural and free of exterior sealers or stains. None of the materials they use are imported. The woods they use only use domestic hardwoods, including Pennsylvania cherry, white birch, Vermont hard maple, and red oak. Palumba focuses on creating handcrafted, natural items. They use solid cherry, walnut, and maple hardwoods for all of their products. This is because these woods have natural colors and they are durable. They use intense attention to detail with all of their toys. They round and soften the edges so that all items are safe for children to play with. You can find a variety of items from dolls to complete toy kitchen sets. 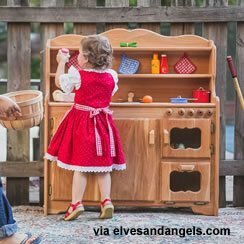 Elves And Angels has been creating durable wooden toys for more than 30 years. This is a family business that is located in northern Maine. Their goal is to make toys that promote child development while lasting for generations. They have a variety of options, such as wooden doll houses, farm and stable play and their wooden play stands. All of the items use strong, high-quality wood that can take a lot of use from children. Tim’s Wooden Toys is operated and owned by Tim Bramlett. He creates all of his toys and gifts in Helen, Georgia. Tim creates all of the toys himself in his workshop. Everything is completely handmade. You can find a variety of classic toys constructed of wood, such as trains, as well as personalized gifts that can be engraved. Tim also offer repair services for toys so that kids do not have to go without their favorite activities and playthings. Nature lovers and parents Kathleen and Justin started Smiling Tree Toys. 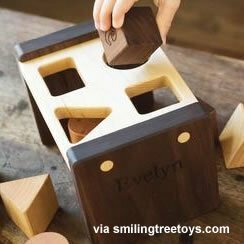 In 2010, they became parents and from there they wanted to start creating handmade wooden toys. It did not take long for people to start enjoying their creations and wanting to buy them for their own children. They offer a variety of items that can be personalized with the child’s name, such as their Spell Well Name Puzzle and their Alphabet Teethers. They also have a variety of gifts, such as their Keepsake Baptism Block. 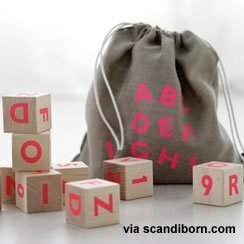 Scandiborn creates a variety of wood toys that kids can use to learn with and entertain themselves. All of the items are versions of classic toys, but they have a modern and simple aesthetic. You can find a doctor’s case that allows kids to socialize and play with other kids and their parents. There is also a wooden toaster set for kids who want to flesh out their play kitchen with some small accessories that are functional. 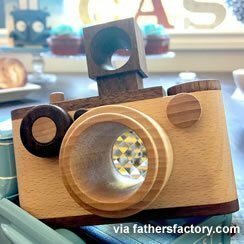 Father’s Factory creates a variety of wood toys that promote play, imagination and learning. Tammy Tan and Jimmy Chen started this company in 2014 after Jimmy lost his job. He loved building toys for his own kids and wanted to share his ideas with the world. This company offers an array of wooden gadgets and toys. You can find a variety of cool toys, such as cars and dolls. The gadgets include a variety of accessories, a camping car and a wooden camera. There are four different camera options to choose from, all of which are different vintage styles. 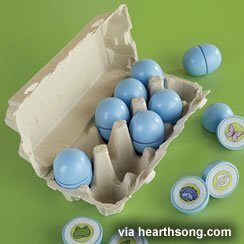 Hearth Song offers toys that accommodate children of all ages. They supply items that are made from durable wood materials. Many of their toys and accessories are colorful, inspiring children to use their imagination during play. You can find small learning toys for young kids such as the Eggsact Match Game and their Pull-Along Quackers the Duck. You can also find toys that promote activity and playing together with their Pick Up and Go Table Tennis game and their 255-Piece Domino Race Set.